Anything else you add brings extra flavor, which could be things like fresh garlic or onions, spices or even nuts or seeds. I keep a notebook of recipes that I started numbering from #1. I would make up a new batch, number it, and then bring it to work for my co-workers to try. Some batches were great, while others were just ok. A few were really bad. A few of my closest co-workers got really hooked on the hot sauce and used to ask for more by batch number. One of the most common requests I got was for batch #19, which is based on fresh orange habaneros, onion, and carrots. It’s hot but really good. After I moved to NYC in 2010 I stopped making hot sauce for a while since my kitchen was a bit smaller and I didn’t have good ventilation (which is critical!) I recently decided to make up a batch of an old favorite recipe, #27. That recipe previously involved cooking fresh orange habaneros on the barbecue until they were blackened. Since I don’t have any outdoor space or a bbq now, I used a cast iron skillet to get some color on the habaneros. 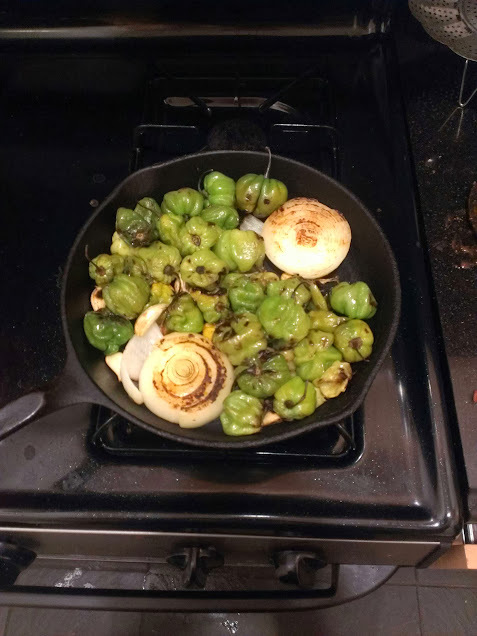 I also couldn’t find orange habaneros in the fall so used green ones. They didn’t seem nearly as hot as the orange ones but still packed a lot more heat than a jalapeno. The final sauce was still really tasty!!! Put habaneros into a cast iron skillet or on the barbecue until they start getting blackened a bit. Add the onion and garlic and cook until habaneros are soft and well charred. Onion should be soft. Garlic will still be firm but have a bit of charring. Remove stem and core from habaneros by pulling the stem with your fingers while holding the habanero with a fork or something besides your hands (since you want to keep skin contact to a minimum.) It should come out fairly easily. Don’t worry about leaving seeds or some of the core. Add habaneros, onion and garlic into a blender or food processor and add vinegar and water (50/50) until there is just enough for it to blend well. Blend until fairly smooth. Dump the blender into a strainer and pass the mixture through to remove any remaining seeds and skin. Press this well with a spoon to make sure you get all the good stuff. Add vinegar and water until the remaining mixture is about the consistency of hot sauce. It will thicken a bit when it sits so it can be on the thin side. Now comes the fun part. Add about a teaspoon of the salt and taste. It’s going to be hot. Keep adding salt until it tastes slightly salty. Keep some cold water or milk handy while you’re doing this. It’s going to be a lot hotter right now than it will be in a week so just hang in there. You might also need to add extra vinegar if you like it a little more sour. Once it tastes right, bottle it and keep it in the refrigerator. There should be enough salt and vinegar to keep anything from growing in it, even at room temperature, but it will likely last longer in the fridge. 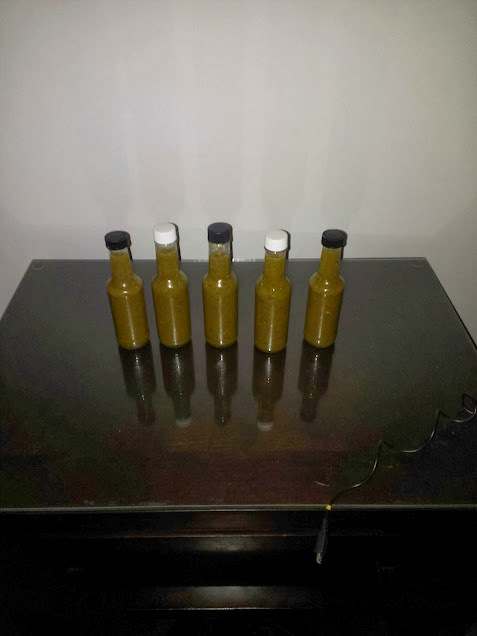 Finished hot sauce ready to torture co-workers with! As frugal as lentils are, there’s something about the standard lentil soup with carrots, onions and celery that just doen’t taste good to me. I really didn’t like lentils until I started cooking them Indian-style. Not only are lentils inexpensive, but the Indian spices and seasonings used are too! They’re also pretty easy to find in any American supermarket. If you’re not familiar with Indian cooking, there’s a very popular type of dish known as dal (or dahl, daal, dhal). They are nearly always made of some sort of split peas, beans or lentils with Indian spices like turmeric, cumin, chile, and coriander. The combination makes for a really tasty dish that (IMHO) is way better than any American preparation of lentils. When I started cooking Indian food, I went to YouTube because it was so different that what I was used to cooking and I wanted to see someone do it first. I now have two favorite YouTube Indian chefs that I always go to when I want to make Indian food. Their videos are very easy to follow and their recipes turn out great. One is Manjula (manjulaskitchen). The other is Sanjay (vahchef). Here’s one of Sanjay’s recipes that I just made tonight. It came out great! Of couse, I made a batch about four times bigger than in the video so will have many meals from a $0.99 bag of lentils. To go with the dal, I also made Sanjay’s palak paneer recipe except using extra firm tofu instead of the paneer cheese. It was a great vegetarian meal that was as delicious as it was frugal. Mix everything together. It’s going to seem a little too wet. Just let it sit for 15min to thicken up. I measured these out and dropped into a nonstick skillet using a standard ice cream scoop. It made 7 patties. I bought the salmon on sale for under $3 for the can. That probably made these about 50 cents each. Yikes! What a bargain! Now, there’s a ton you could do with this recipe. I’d keep the salmon and eggs but you could go crazy with the rest. 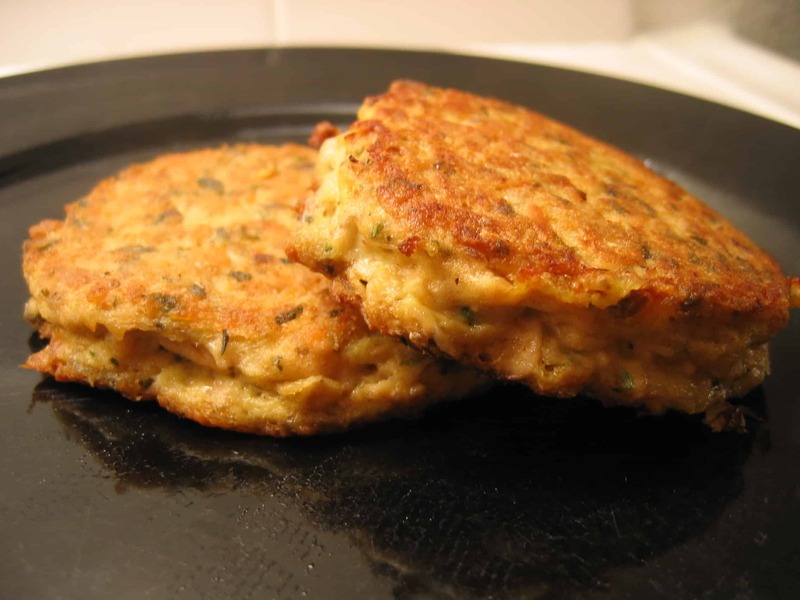 For a more traditional, crab cake-style recipe you could go with Old Bay instead of the herbs de provence. If you don’t have Old Bay, it’s mainly celery salt with a few other minor seasonings. I bet a Jamaican jerk seasoning would also be really tasty in this. Mix it up and let sit for 30min for flavors to mingle. Add more or less cream to change the thickness. You could make this with ground or canned chipotle and it would be really tasty. Adjusting ratios of mayo, sour cream and cream to suit the purpose. More or less cream will make it thicker or thinner. You could actually use water too. I just used cream because I had it handy. This would be awesome with some plain potato chips. Have fun and let me know if you do something delicious with this. 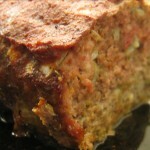 Meatloaf is one of the classic frugal main dishes of all time. You take the most inexpensive cuts of meat you can get and then add inexpensive fillers to make it go even further. In addition, you add finely minced vegetables so your kids won’t notice. Whoever invented meatloaf was either exceptionally lucky or pure genius. 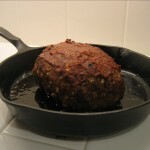 Below is my latest meatloaf recipe that I baked in a cast iron skillet. So to answer the question above, I’d say “one”. But the real question is what pans do you need to make a meatloaf, a roast, cornbread, a cake, fried eggs, bacon, hamburgers, etc… My answer is “just my one cast iron skillet”. Mix all ingredients well and shape into a cylinder. 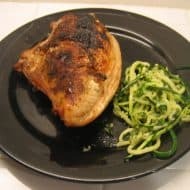 Place into a lighly oiled cast iron skillet and put into a 350F oven for 1 hour. After about 40min coat with the ketchup. You’ve probably noticed that this meatloaf is pretty much all meat. I’m still doing the low carb thing and its working (down 15lbs so far!) 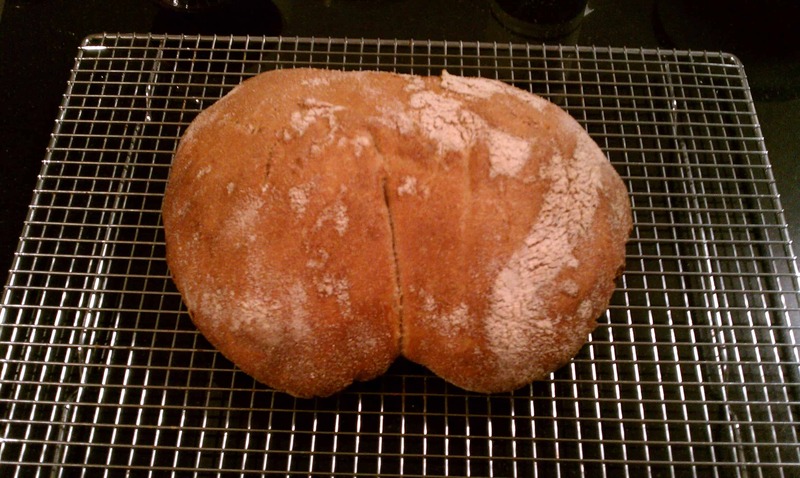 so I left out the bread/crackers in this one. You could add in a few slices of bread torn into pieces with some milk to wet the bread. Crackers would also work. I’d probably not use more than a cup of crushed crackers or two cups of bread for this amount of meat. The thyme and sage in this give a little hint of breakfast sausage flavor. You could also leave those out and use breakfast sausage instead. To keep this low carb, another nice addition would be some finely chopped mushrooms. I’ve done that before and it comes out really great. Just chop the mushrooms into small bits and then fry to remove most of the moisture. Then just add them to the meatloaf. You could also add italian seasoning mix (1T) and parmesan cheese (1/2 to 1 cup) to make the meatloaf taste like a giant meatball. I could probably come up with an infinite number of possibilities. Saute the onion in butter until soft, about 10min. Add in the rest of the ingredients, except broccoli, and simmer over low heat until the cheese melts and you have a nice sauce. 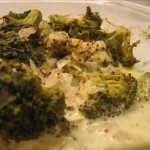 Turn off the heat, add the broccoli and toss well. Put into a baking pan (or another cast iron skillet!) and bake uncovered for about 30min on 350F. Serve with meatloaf. I’m not sure why I think this recipe is French. Maybe it’s the combination of beef and thyme. It could be the great sauce that results. It could be how simple yet delicious it is. Anyway, this came out really well, so maybe I should just rename it Delicious braised short ribs. One of the reasons this came out so well is that I cooked the short ribs long enough to kill the toughness but short enough to leave a really nice chewy texture. So instead of the meat falling apart like eating pot roast or beef stew, it was like eating tender steak. There was enough time for the flavors to come together and make a really nice sauce. Brown the beef in the oil. Let it get brown! Add the onion half way through. Add everything except the mushrooms and turn to low, cover and simmer for about 45 minutes. Add the mushrooms and cook for another 10 minutes. 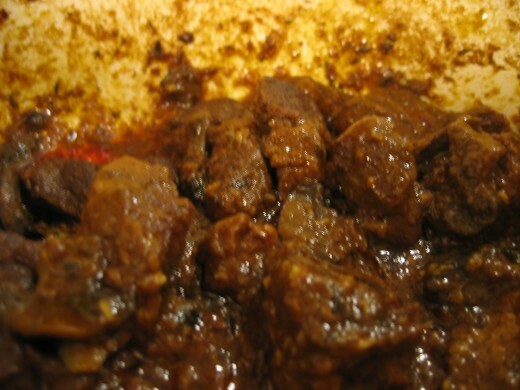 Is the sauce is watery when you add the mushrooms, turn up the heat and leave the lid off. Serve with a starch like mashed potatoes or over some noodles. I ended up just eating it straight. YUM!